A look ahead past the OpenEVSE II prototype. I got a hint from someone on the OpenEVSE group to consider looking into FPC/FFC instead of ribbon cables. I like what I found, so the 0.2 version at this point is being designed to use FPC as the mezzanine cable. The relays on the relay board are only rated for 30A. If you want to make a beefier EVSE than that, in the past you've had to do a custom design with pilot relays and contactors. 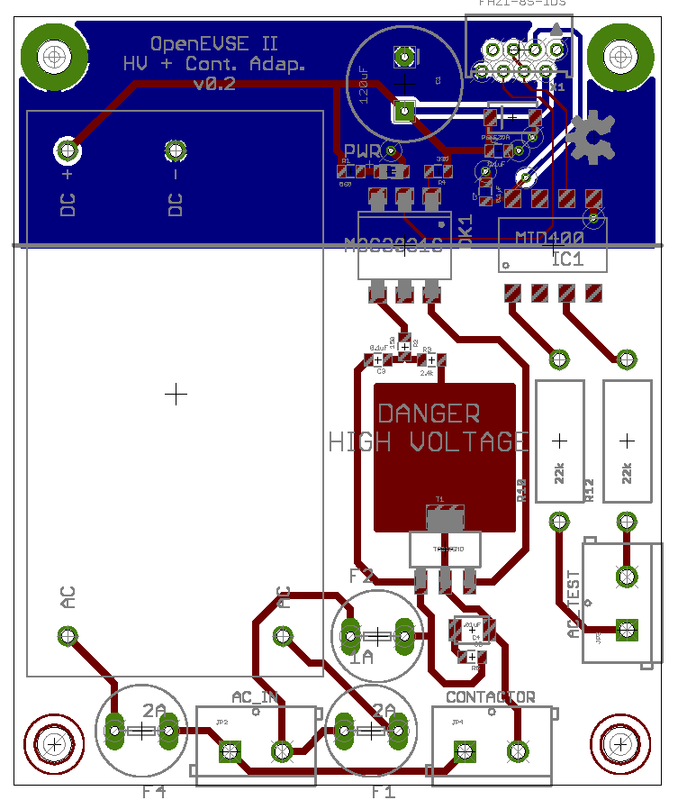 I designed a contactor adapter triac board to try and ease that a little bit, but for OpenEVSE II I've designed to offer two options for the HV board. The HV+Relay board will work at both L1 and L2 (since the relay coils are DC), and be useful for designs up to 30A. For higher powered designs, there will be a contactor driver HV board instead. The contactor version of the HV board will have the same FPC/FFC mezzanine connector, but on the HV end, there will be 3 2 pin screw terminals: AC Line, AC Test and Contactor. The first two are connected to the line and load sides of the contactor, and the third is connected to the contactor coil. Most contactors have .25" QD terminals, plus for the line and load points, large box-screw terminals for the high current path. You would assemble a high-powered EVSE by running 22 gauge wire with QD terminals from the contactor to those points on the HV board. The rest is the same as the relay version: You run a bonding wire from one of the grounded chassis mount screws over to the ground bus, you run the FPC/FFC mezzanine cable to the logic board, connect the CTs and the J1772 pilot line up to the logic board, then wire the line and load side of the contactor, passing the J1772 hot lines both through the GFI CT and one (only) through the ammeter CT. The board is much smaller than the relay board - it's just under 2 1/2 x 3 inches. It should make it much easier to put higher powered EVSEs in smaller chassis than was previously possible. In fact, I wouldn't be at all surprised if a 50A rated unit couldn't be constructed in Chris' chassis!